– all fabrics are shades of brown/tan/sand with an undertone of gray. The undershirt is the lightest of all cream or sand in color. The cross wrap and arm wraps and optional headpiece are a shade or two darker than the shirt. The pants are the darkest and have the most gray but still should appear somewhat brownish. The darkness of the fabrics starts with the undershirt and gets darker. This can allow for lighter color combinations and darker combinations that are seen in all the published materials.. The undershirt is a jersey cotton v neck with cap sleeves. The seams of the shirt are on the sides under the arms. The v neck is finished by rolling the fabric to the inside and top-stitching. The hem is finished and undershirt should hit just below the hips. The undershirt should be cream, light tan, sand in color with an undertone of gray. The undershirt is the lightest of all the garments worn. Pants are the darkest of all the garments worn. Pants are a light brown with a gray undertone. The pants end just below the knees and are not fitted. The cuff at the bottom is formed by fabric ties that wrap around the pant leg to hold it in place. (optional: Longer ties may be used that continue down the leg to the boot. ) .. Bag is a dirty brown canvas bag with a flip top that is secured by a strap with a buckle and an alice clip. See the Visual Dictionary reference photos for close-ups. Bag is slightly darker than the pants but lighter than the belt. Bag should be worn on the lower belt snug to the body and on the side towards the back. Due to the weight of the bag, costumer may wish to secure the placement with a piece of hidden Velcro that would attach to the undershirt on the side. Bag should be proportional to costumers body in size. Dark brown with a gray undertone and made of a cotton/wool weave, they have a medium to light brown sole (slightly lighter than the main boot) and end just above the ankle. The heel of the shoe is leather or leather like but is the same brown tone as the fabric of the shoe. There are brown leather or leatherlike straps (two on each side) and a strip of leather or leatherlike the same as the heel that goes up the back of the boot. The boot is laced in the back by threading the dark leather or twine lacing through the straps and across the strip in the back of the boot. Ends of the laces are then tucked in so as not to be seen. These are strips of fabric that are wrapped around the arm of the wearer on both arms. Wraps are have unfinished edges and are tucked in to secure. Wraps start about halfway down the upper arm and end about halfway down the lower arm. Wraps are about the same shade as the Main wrap or a shade darker. The arm bracer is made of leather and wraps around the arm. It is fastened by threading back into itself. The bracer should be the same dark brown as the belt with the inset that threads back through being a shade lighter. Bracer is worn on the left arm and goes from the wrist to the bottom of the cloth arm wrap. The inset is slightly lighter than the bracer. Please note if optional head-wrap is worn, hair just must not be visible. If no Head-wrap is worn, hair is to be pulled back and there are three tightly made loops of hair that have the appearance of buns or knobs the lowest being the “ponytail” and the highest just below the crown of the head. There may be small hairs pulled out on the sides but that is optional. No bangs. Tattoos and body piercings – No tattoos or body piercings may be visible. They must be covered with makeup or by the costume. 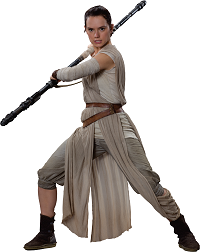 The following items may be used with the Rey costume but are not required for approval unless for a high profile event. Some items must be worn combined with others, some are ok worn on their own or in combination with any others. Head-wrap: The head wrap is a large long sleeved jersey cloth like shirt where the neckline is the frame around the face and the sleeves are twisted and wrapped around the costumers head. The wrap crosses in the front and ties in back and the ends are then tucked in at the sides above the ears. The bottom of the shirt forms the “shawl” that should fit slightly loose across the shoulders The Head-wrap should be the same color as the arm wraps and slightly darker than the undershirt. Bottom of wrap is unfinished and ravels in places. Hair must be fully tucked in and not visible when head-wrap is worn. Staff: The staff should be proportional to the costumer’s height. It should be about 6-8” (15.24 cm to 20.32cm) above the head of the costumer when held straight up. Staff has a dark brown or black strap attached with rusted buckles. Staff is extremely detailed and will be compared to the photo references to determine closeness in detailing for approval. Staff is weathered. Goggles: If you are doing goggles you must also do the head-wrap as they are worn together. Goggles are made from three layers of leather or leather like fabrics. The bottom and top larger layer enclose the lenses which are dark black green in color. (TK bubble visor may be used) The smaller third layer is made from a suedish type fabric that is lighter than the other two layers and has stitching around each entire lens with a double stitching at the bottom of the lenses. Goggles have two rusted metal clips on each side. Small and thin (about two inches long) flashlight is on the right side of the goggles and is attached to the lace between the strips. Light should be a very dirty gray and can be wrapped or unwrapped with cloth that matches the arm-wraps. Goggles are secured by a black dark brown lace (leather, elastic cording, or twine) that thread through the leather strips (forming a triangle shape) and then tying in the back. The ends and tie are hidden in the folds of the head wrap. Goggles may be worn down or up. If worn up they should sit above the twisted wrap in the front. Second Gauze Wrap: A Second wrap (same color as main wrap) that goes from the back left (end is just under the top belt) following the main wrap up the back over the left shoulder crosses to the right side hiding even more of the shirt, twists and goes across the back around to the left side between the center of the belts on the left side hiding the belt behind the twine lacing, across the front and then tucking in the belt and ending at the back where it started. No more than three or four inches of the ends should be seen below the belt. Backpack: Very large dark brown Leather or leather-like backpack secured with canvas straps and rusted rectangular buckles. See Reference photos for details. Mesh scavenger bag: Large mesh scavenger bag – center is mesh and sides are burlap/canvas. Very brown and dirty looking. Must be worn with backpack and canteen. Canteen: Small metal container that hangs on backpack. must be worn with backpack. Lightsaber: Lightsaber may not be used for action photo. Luke’s ANH or ESB lightsaber Lightsaber is only carried with the basic formal outfit and no other optional item except blaster. Blaster – LPA NN14: See Visual Dictionary reference for details. Blaster is worn tucked into the back of belt opposite where the bag hangs. It is held in place by the two belts. Blaster may not be worn with backpack, headwrap, second wrap, or goggles. It may or may not be worn with lightsaber. Glasses: Please note as this character does not wear glasses it is highly recommended that for costumers that need to wear glasses for medical reasons that the optional head-wrap and goggles be also made. This will allow you to safely wear your glasses while keeping them hidden and not breaking the audience’s illusion of what Rey looks like.